We will move your piano anywhere. 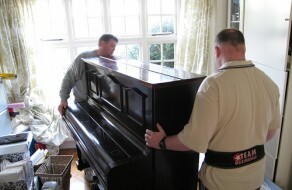 Whether it is a spinet, upright, baby grand or concert grand, trust us to be your professional piano mover! The most important part of piano moving is packing the piano. This means wrapping the piano in a series of blankets so that the surface of the piano isn’t scuffed or gouged (refinishing a piano can be very expensive). Making sure the piano is moved in a way that avoids damaging bumps and scrapes is a piano mover’s second most important task. Any professional piano mover worth their salt will have special tools for the job: like a piano dolly (a heavy duty 4-wheeled dolly with uni-directional wheels that can support a piano’s weight) and a piano board (a long board that the piano is strapped to for the purpose of moving the piano). • ATV shuttle vehicle, e-track piano moving boards, custom dollies, etc. • We come HIGHLY recommended amongst our peers.